... then under the thwart, to finally end up in small RWO lance cleats mounted on each side of the thwart for the helmsman. The double blocks here are meant to receive another line, the outhaul line, which will also be coming back to the helmsman. 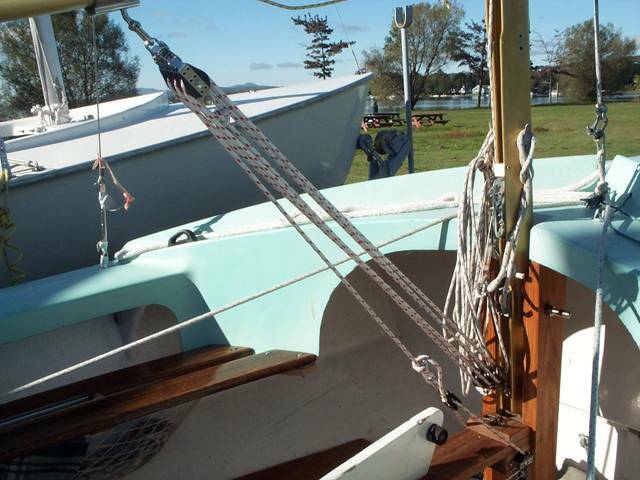 Our jib halyard is now made out of stainless wire. It hooks up to a Holt-Allen lever bolted to the mast. In the middle position the entire rigging is under great tension. The result is that the jib now keeps a straight line even when it’s blowing out there. The pointing ability is therefore improved. Installed jibsheet tracks with railings between the front benches. The jib sheet now goes inside the shrouds (although this is not the real angle on this picture), which also provides much better pointing ability when sailing close-hauled. 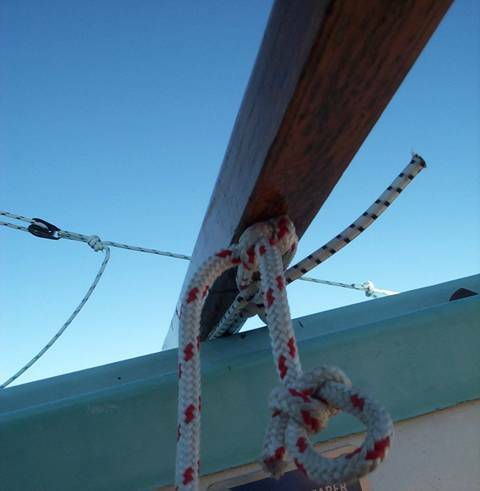 The sail cloth tension is now properly adjustable along the jib luff, thanks to a cunningham with a control line coming back to the mast. No more wrinkles. Hard to tell from this picture, but the site has a nice suggestion for this line, which replaces the cumbersome bungee cords and hooks. Thanks to this system we got rid of all the pins holding the tiller in the rudder head. There’s sufficient pressure to keep it holding together. 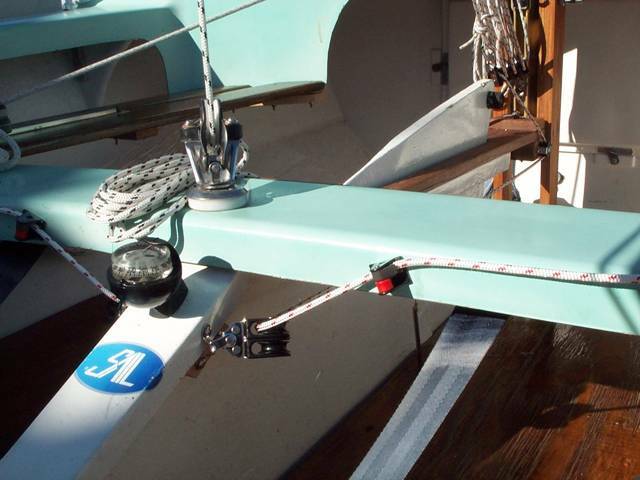 Using a bridle improves the mainsail leech shape. The traveler is now a backup system for heavier winds. 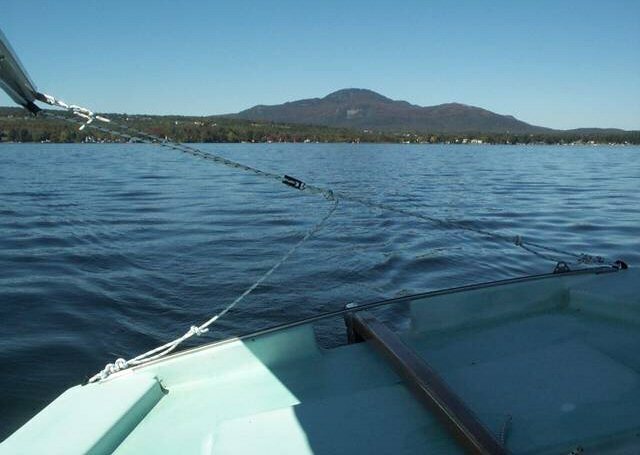 It was, however, a total mess when we used it the last time: the traveler pulled out from the transom in a strong gust. Had to replace what was left of the wooden beam underneath to refit it. 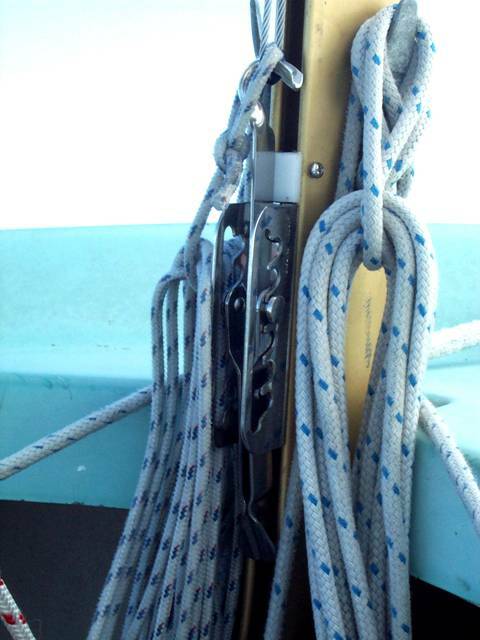 You may perhaps also see from the picture how small the mainsheet is. 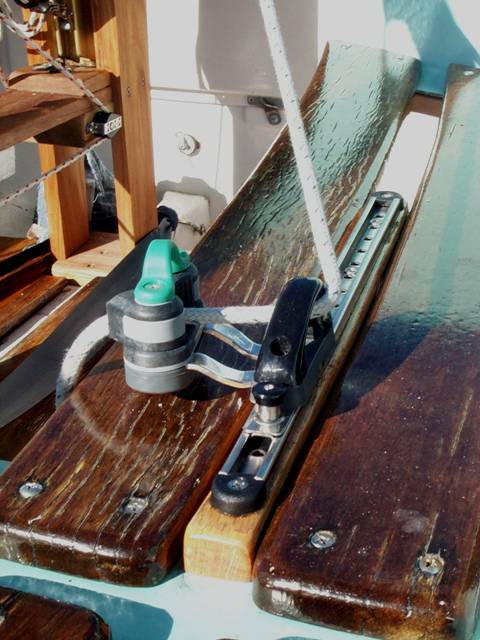 We followed Uncle Al’s suggestion to go with Harken 082 blocks and very thin line. 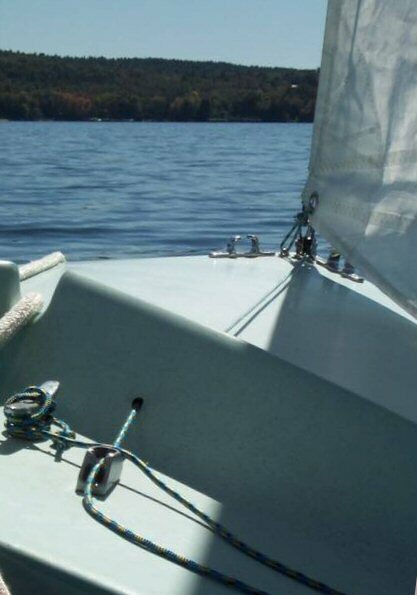 It’s a little tougher on the hands, but you can really let the sail out easily, which is safer. 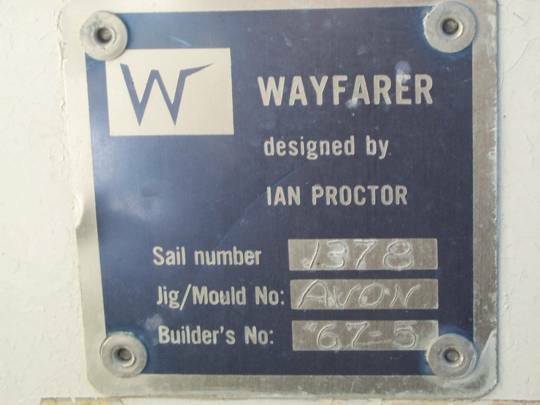 So all in all, the old 1967 Wayfarer is improved in many ways. The most important project remains to make the buoyancy tanks watertight again, along with refinishing the gelcoat. But this will not be before years, since we first need to… move into a house with a garage. Until then, we’ll learn how to windsurf, or buy a Laser I/Laser II to go out in the really windy days. The floating museum cannot really sustain winds heavier than 18 knots, or to put it differently, we can’t cope with the idea of not self-rescuing. Like W1378, we are getting older--never had such scary thoughts on the Sarasota Bay.